Online in Japan, people are calling new children's show Dxuntsukupa: Music Time, well, "odd," "awful," and even "very interesting." When foreigners visit Japan, one of the first things they say is that the country's television is unusual. Generally speaking, I don't think it's too peculiar. Most shows are just people eating stuff or talk shows with people telling jokes or stories. It's all rather same-y and somewhat dull if you don't understand Japanese. But then, there's the occasional program like this. 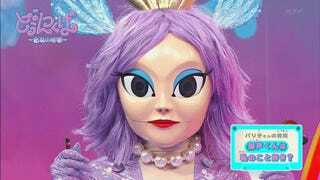 Dxuntsukupa, which is set in the world of a "music fairy," looks like it would be a kids' music program—especially with all those pastels, a purple "hip-hop fairy," a sax-playing robot and kiddy cohosts. But no, the show broadcasts at 11pm, so it's not a children's show. However, the show's official website says it was designed to look like a children's music show, but simply broadcasted at an adult time. But, as this 2ch thread shows, the program's graphics are rather unique. For example, below, that's the floating head of ghost writer Takashi Niigaki, who composed music for Resident Evil while another man apparently feigned deafness and took all the credit. It's interesting to see that Niigaki hasn't been disgraced and is a regular on the show. Here he is playing as the kiddy co-hosts sing. The show features your typical array of Japanese boy bands—as do other music shows on the major networks. The show featured a bosozoku choir, singing about a balloon that could go anywhere. And then, there is Bariko-san, the classical music fairy. 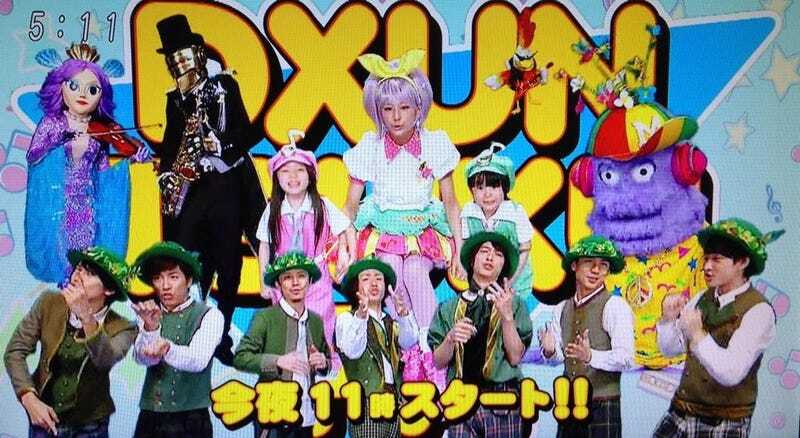 Dxuntsukupa does seem to resemble the legendary Japanese kids show Ugo Ugo Lhuga, which was wonderfully nuts. As website Dangerous Minds explains, musical acts ranging from Shonen Knife to Jamiroquai would perform. (See clips here, here, and here.) There was some wild computer animation. Since both shows are from FujiTV, I'm assuming the similarities are on purpose. Hopefully, Dxuntsukupa is just getting started and has more insanity up its sleeve. Stagnant Japanese television needs it.